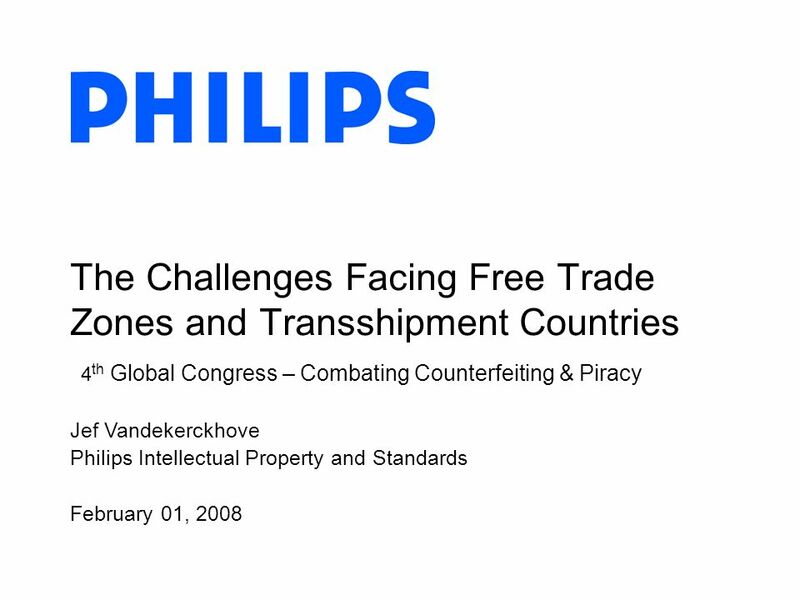 Jef Vandekerckhove Philips Intellectual Property and Standards February 01, 2008 The Challenges Facing Free Trade Zones and Transshipment Countries 4 th. 2 Philips Intellectual Property and Standards, Jef Vandekerckhove, February 01, 2008 2 Definition: Free Trade Zone A part of the territory of a contracting party (country) where any goods introduced are generally regarded, in so far as import duties and taxes are concerned, as being the customs territory (Revised Kyoto Convention 1999). 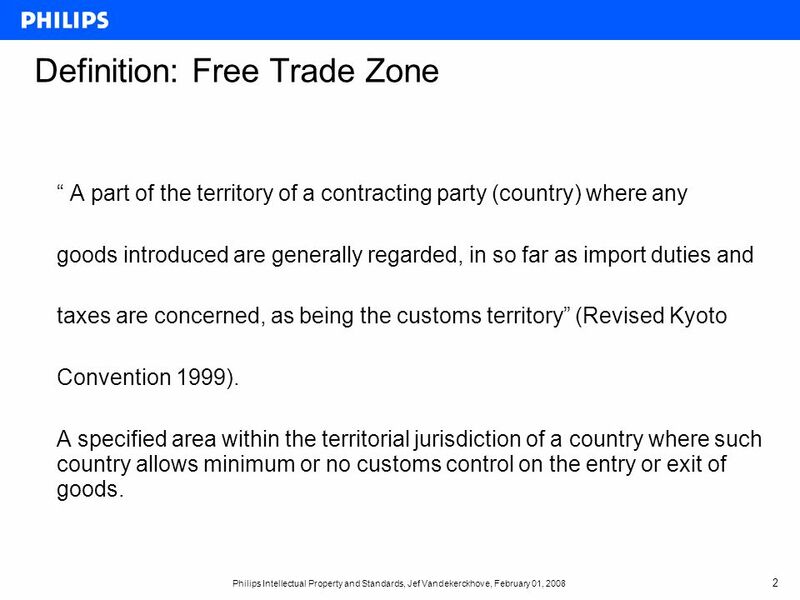 A specified area within the territorial jurisdiction of a country where such country allows minimum or no customs control on the entry or exit of goods. 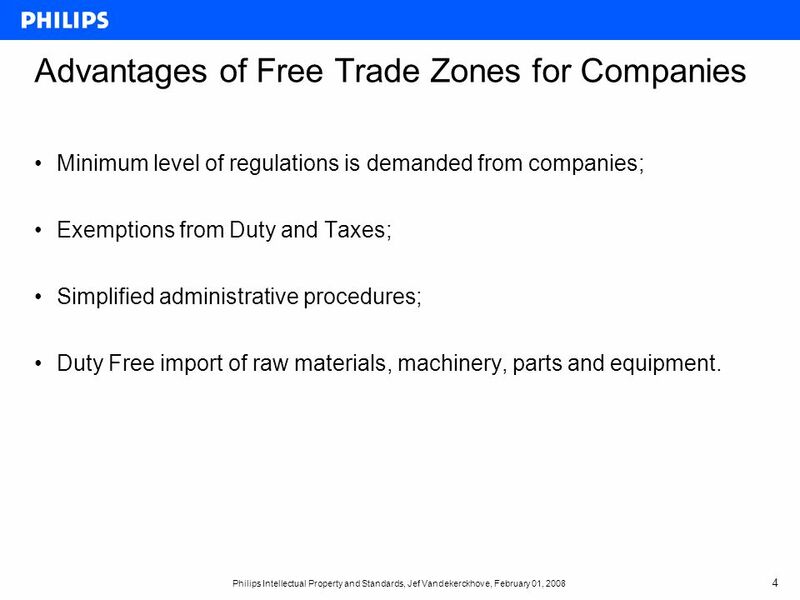 4 Philips Intellectual Property and Standards, Jef Vandekerckhove, February 01, 2008 4 Advantages of Free Trade Zones for Companies Minimum level of regulations is demanded from companies; Exemptions from Duty and Taxes; Simplified administrative procedures; Duty Free import of raw materials, machinery, parts and equipment. 5 Philips Intellectual Property and Standards, Jef Vandekerckhove, February 01, 2008 5 Definition: Transshipped Goods = Goods re-exported through Free Trade Zones Sea shipments: unloading goods into a port, transporting them to a warehouse for storage and/or transferring them to another vessel for export to another destination/ Land shipments: goods entering one country for direct movement and sale to another country. 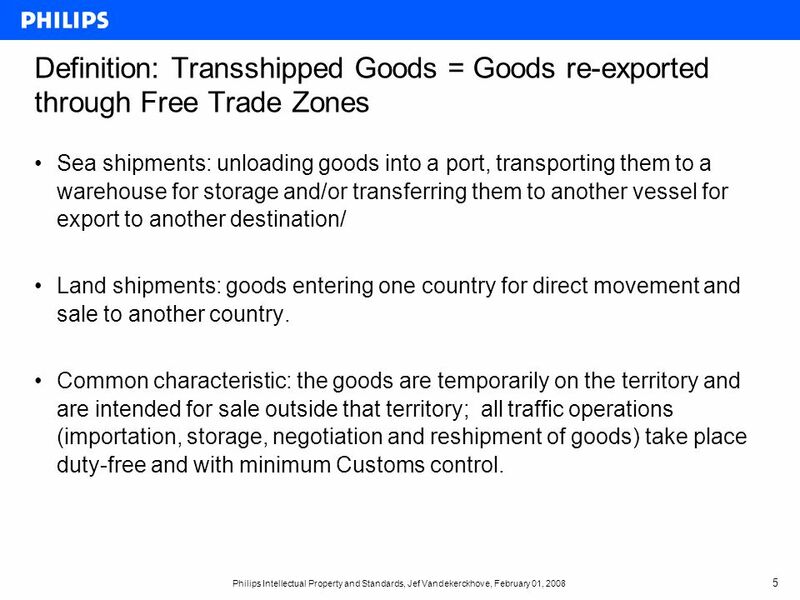 Common characteristic: the goods are temporarily on the territory and are intended for sale outside that territory; all traffic operations (importation, storage, negotiation and reshipment of goods) take place duty-free and with minimum Customs control. 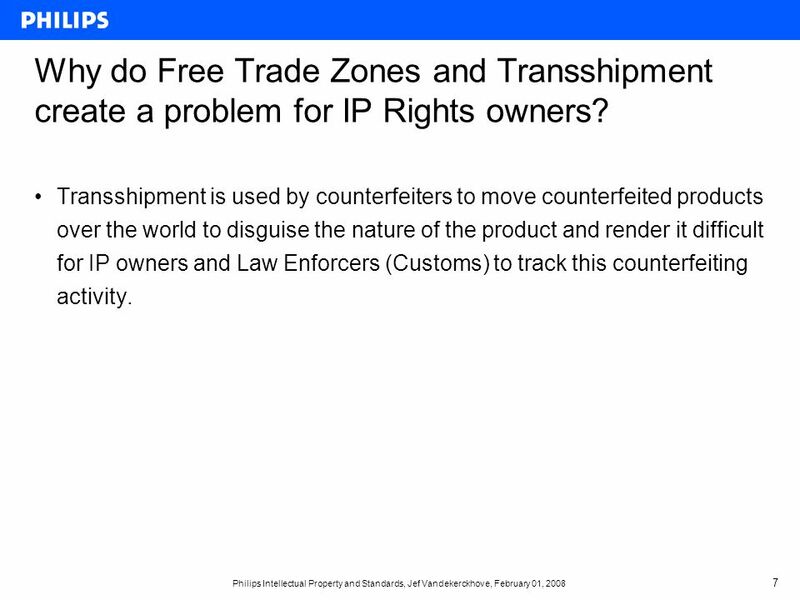 7 Philips Intellectual Property and Standards, Jef Vandekerckhove, February 01, 2008 7 Transshipment is used by counterfeiters to move counterfeited products over the world to disguise the nature of the product and render it difficult for IP owners and Law Enforcers (Customs) to track this counterfeiting activity. 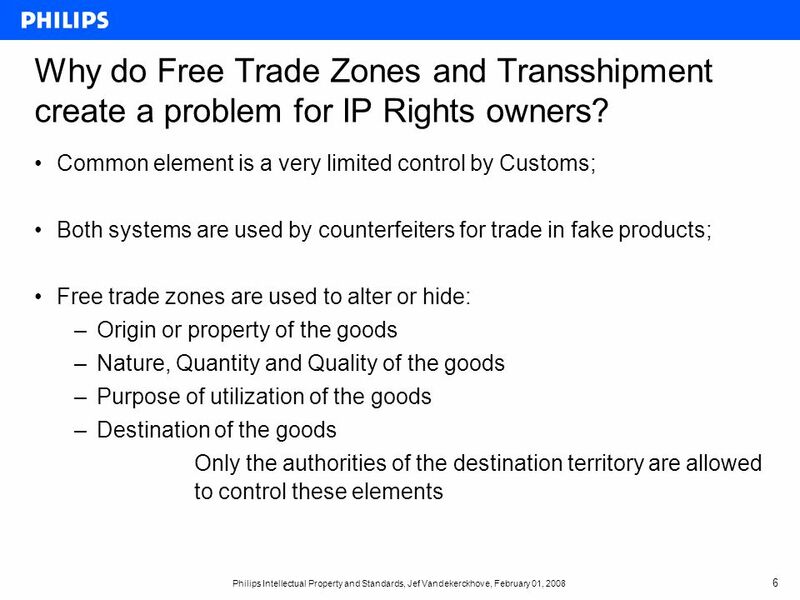 Why do Free Trade Zones and Transshipment create a problem for IP Rights owners? 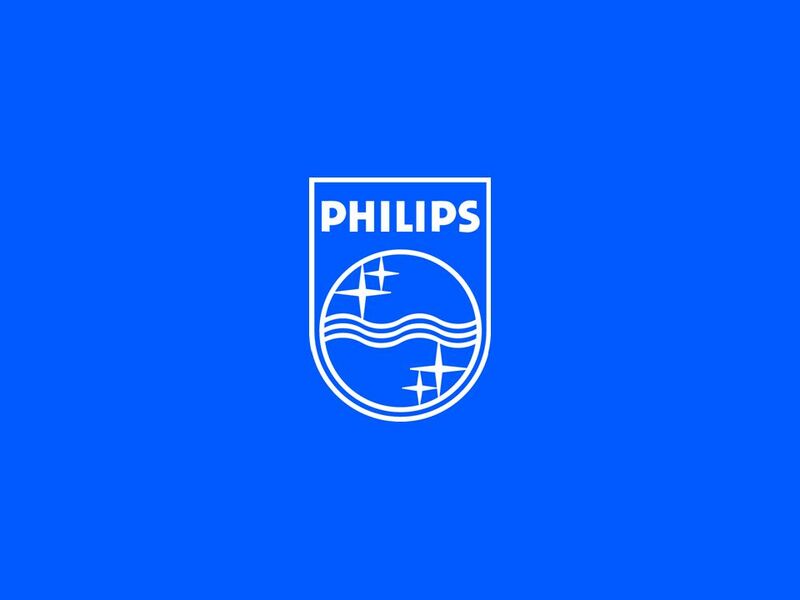 8 Philips Intellectual Property and Standards, Jef Vandekerckhove, February 01, 2008 8 Latest trends with respect to Free Trade Zones and Transshipments? 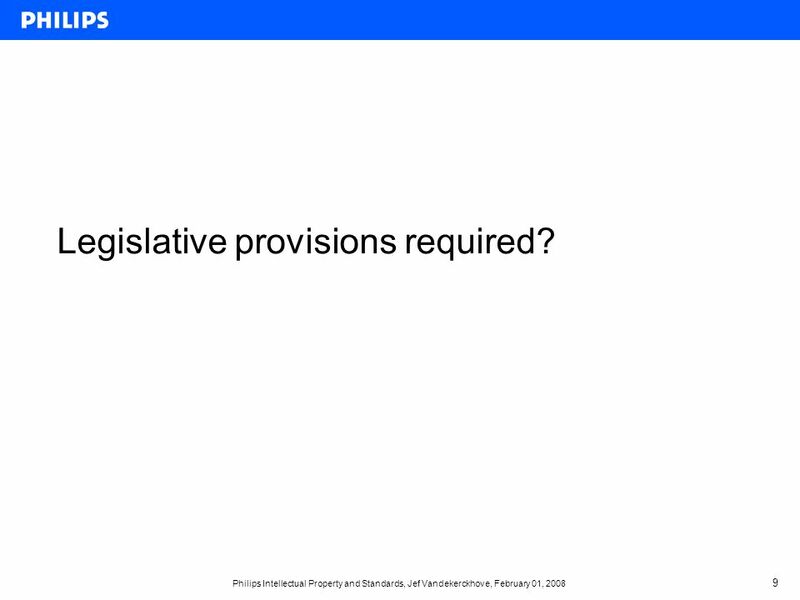 9 Philips Intellectual Property and Standards, Jef Vandekerckhove, February 01, 2008 9 Legislative provisions required? 10 Philips Intellectual Property and Standards, Jef Vandekerckhove, February 01, 2008 10 Which Enforcements Policies and Procedures are currently at our disposal and are they working? 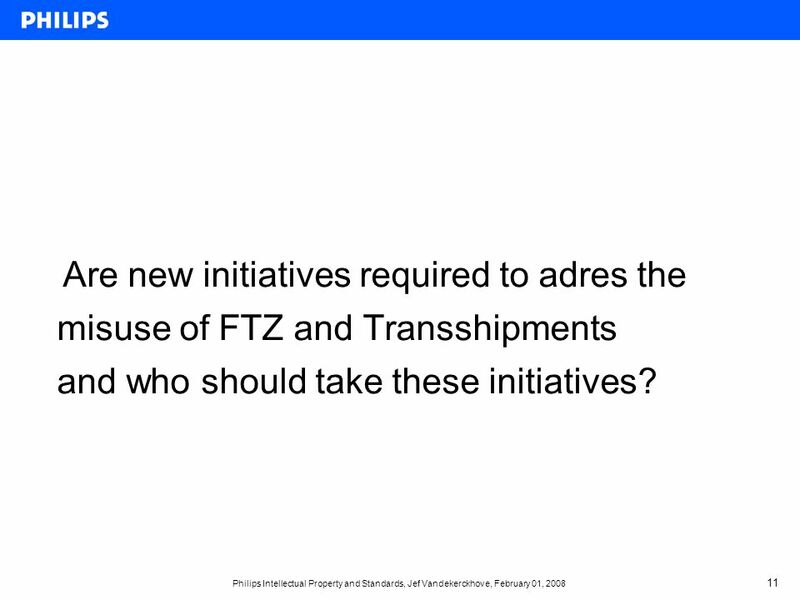 11 Philips Intellectual Property and Standards, Jef Vandekerckhove, February 01, 2008 11 Are new initiatives required to adres the misuse of FTZ and Transshipments and who should take these initiatives? 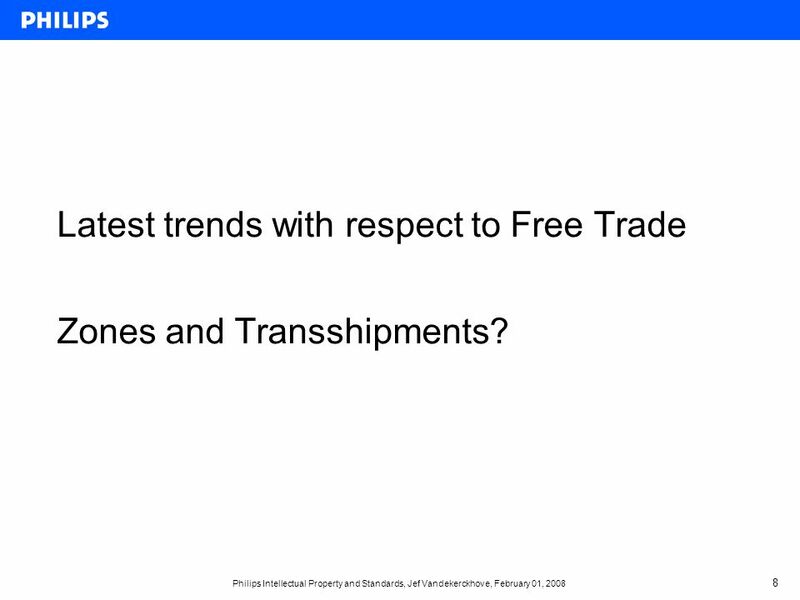 Download ppt "Jef Vandekerckhove Philips Intellectual Property and Standards February 01, 2008 The Challenges Facing Free Trade Zones and Transshipment Countries 4 th." Research of Law and Regulatory Environment for Transit Transportation Purev NARANTSETSEG 11 March 2008 Ulaanbaatar. 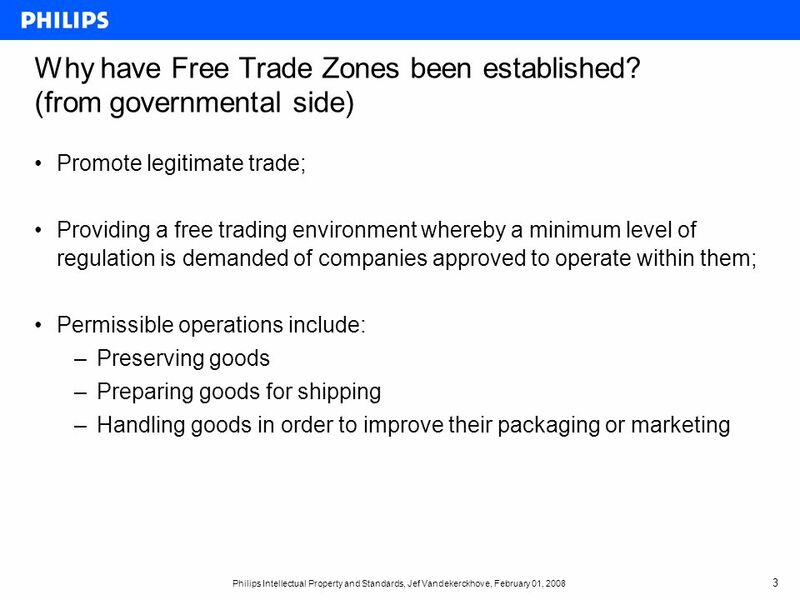 1 Trade Systems Main Customs Procedures 1. Transit 2. Processing under customs control 3. Home use 4. Customs Warehousing 5. Temporary Admission 6. Inward. Defining Unilateralism under International IP Law: The Case of Border Measures Against Goods in Transit Shashank P. Kumar LL.M. (Yale 11); B.Sc., LL.B. 1 Pricing for International Markets Broad-based pricing policies Terms of Sale Terms of Payment Countertrade. Inbound Logistics Incoming Cars 1.Delivery from outside of the EU – to the bonded warehouse from: Russia South-Korea Japan And other countries 2.Delivery. 1 Permits and Certificates CITES Secretariat. 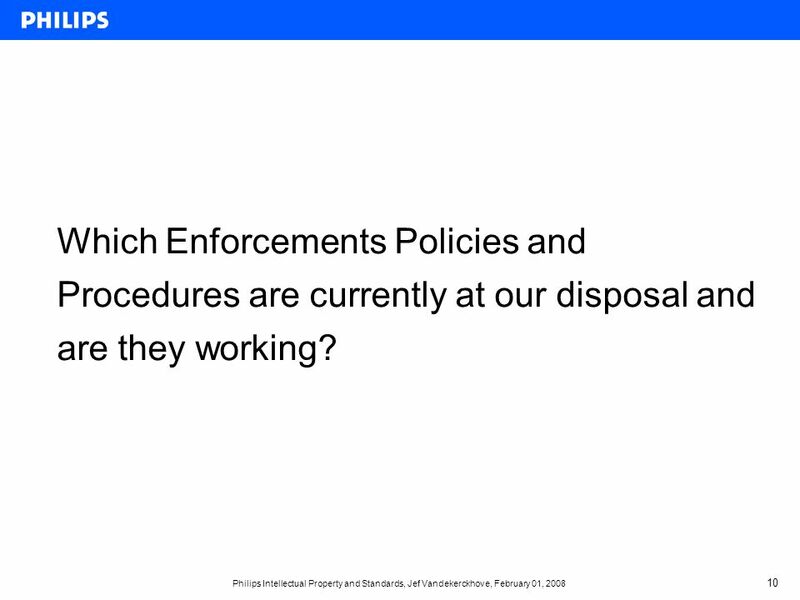 2 Overview Permits and certificates Normal procedures. Export of mercury and mercury waste Sven Hagemann GRS. 25 November 2014 Intellectual Property and International Business Seminar Business Priorities to Fight Counterfeits in Croatia Tracy Faustin ICC BASCAP. China’s Practice in Statistics of Goods for Processing By Hongman JIN Statistics Department General Administration of Customs the People’s Republic of.